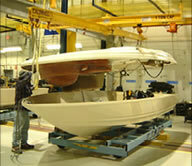 Total System Access - Total system access is one of the many features of The RSI In-Floor Tow Line Conveyor System. The system is virtually free of structural interferences. 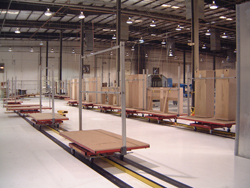 Throughout the entire conveyor, employees have the freedom of mobility with access around and between carts. Because of the simple modular design of The Rhodes Conveyor, systems can be easily and quickly expanded, preventing costly plant shutdowns with minimum or no loss of production. Power and Free - The RSI Tow Line Conveyor is a power and free system. Unlike other conventional systems utilizing fixed cart spacing, carts on The Rhodes Tow Line Conveyor can be placed into workstations upon request, processed on a variable time frame, then randomly distributed back into the system for additional operations. Durability - Robust components used on The Rhodes Tow Line Conveyor Systems have been time tested to ensure that they adhere to the highest standards of quality, longevity and merchantability. Variable Centers - The RSI Tow Line Conveyors have the capability to easily accommodate infinite variable centers. 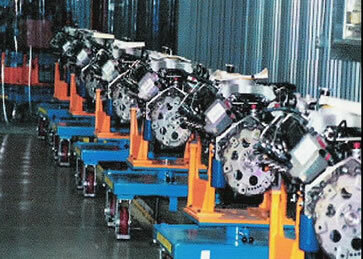 The system has been engineered to run multiple drives on one precision calibrated tow line chain. Accordingly, every horizontal chain link is a potential cart center. Spacing of carts is unlimited. Cart Delay and Close Packing - The RSI Tow Line Conveyor allows the tow pin, on any cart in the system, to disengage the chain. This delays the cart at preset workstations. The next approaching cart causes this delayed cart to re-engage the chain and continue on, allowing the next cart to enter the workstation. Carts will stop and remain in zero-pressure accumulation whenever encountering a track-mounted stop devise. When the stop is released, the cart will automatically engage the chain and continue through the system. Cost savings abound with cart accumulation as equipment sizes are reduced and valuable plant space is saved.